During pregnancy, expectant mothers are often faced with a plethora of things they can or can’t do or simply shouldn’t do while pregnant. And should they decide to breastfeed, that list goes on even longer. Luckily, lactation teas take away some of the stress that comes along with breastfeeding, and this review of the Earth Mama Baby Milkmaid Tea might be what helps expectant or nursing moms decide if it’s best for them as they work on breastfeeding. 1 Why Earth Mama Baby Milkmaid Tea? Why Earth Mama Baby Milkmaid Tea? While some doctors may claim that the breast is best and others will swear by the similar benefits of formula feeding, ultimately it’s up to the mother to decide what’s best for both her and baby. With the Earth Mama Baby Milkmaid Tea, which helps promote lactation and makes the process smoother for both baby and mom, going the breastfeeding route might seem a little more approachable and a lot less intimidating. While it is not recommended for use while pregnant, the Earth Mama Baby Milkmaid Tea is formulated with the kinds of mineral-packed herbs, such as fennel seeds, which help support lactation and milk growth. Some new moms may not even know such an option exists, and since it can be used in place of teas that are high in caffeine or sugar content, the Earth Mama Baby Milkmaid Tea may be the route to take. A box of 16 tea bags can be purchased for $6 on the tea’s website, but you can always check here for the latest prices! It can be used by lots of different moms: Because the Earth Mama Baby Milkmaid Tea is certified Kosher by EarthKosher, moms who might need Kosher-friendly meals or drinks can enjoy it too. There are benefits for moms too: While the tea is made specifically to help along the lactation process with breastmilk, the Earth Mama Baby Milkmaid Tea also helps to alleviate gas, bloating, indigestion, and Irritable Bowel Syndrome in women. It helps moms with lactation issues: The biggest feature of the tea is that it’s formulated to help produce more breastmilk for moms, whether they’re pumping or breastfeeding exclusively. The health benefits for breastfeeding moms are hard to ignore. Not only is the tea healthy through breast milk, but it also has the added digestion benefits for the mom drinking it. 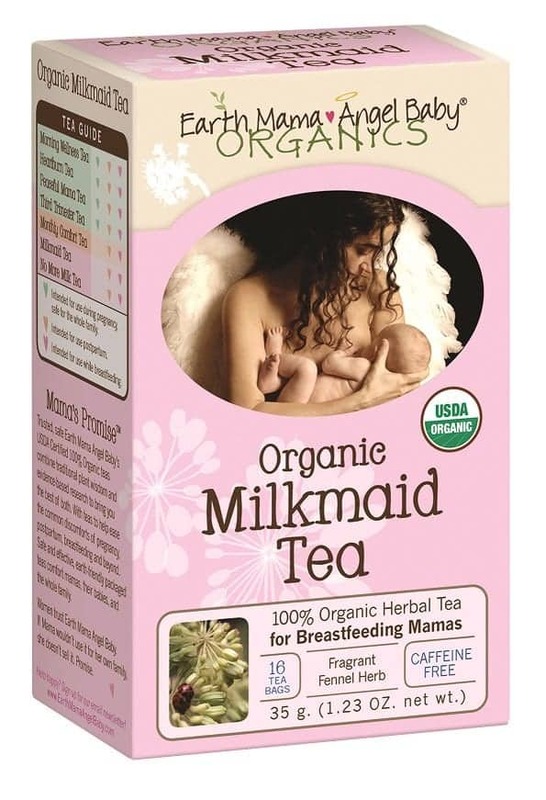 The Earth Mama Baby Milkmaid Tea makes breastfeeding itself a little easier on both mom and baby. It promotes lactation, which can be a struggle for new moms or even the more experienced mothers. The tea can be made into hot tea or iced tea, depending on the mother’s preference, which enables her to switch it up daily. Since the tea can taste milder to some moms, it might be off-putting in that it may not be strong enough to feel substantial. Although the Earth Mama Baby Milkmaid Tea is made to promote lactation. There is no guarantee and some mother might not see the kind of increase they hope for. Since all babies are different too, the tea might end up making babies a little gassier after drinking the milk supply. Here are a couple other options you can try out as well. Made with all natural ingredients, the Nursing & Lactation Tea by Mother’s Select is made to be good for both mom and baby, while aiding in producing more breast milk. Since what moms drink and eat affects breast milk overall, the tea also claims to be formulated with antioxidants and minerals that not only help increase the breast milk supply but also offer more nutritional value to the baby. Like the Earth Mama Baby Milkmaid Tea, the Mother’s Select option is made with Fennel seed but also with Fenugreek, Anise Star, Chamomile, Green Rooibos, Marshmallow Root, Lemon Myrtle, Spearmint, Natural Vanilla Flavor, Lemon Grass, Blessed Thistle, Coriander Seed, and Lemon Balm. The tea can be purchased online for $20 for a 28 serving package. Of course, you can check the latest prices here! The tea is caffeine-free and contains tons of natural ingredients and is also non-GMO. It’s virtually allergy-free, with no use of any of the following: peanuts, tree nuts, wheat, dairy, shellfish, fish, egg, or soy. The tea is made to increase milk supply on a regular basis. It also “enriches breast milk nutrition” in that the Mother’s Select tea gives babies not only more milk in supply, but also more naturally fortified breast milk. The fennel taste is strong with the tea, but for some moms, depending on how much loose tea is used, it may be more or less strong. The cost at $20 per box might deter some parents. The fact that it’s loose leaf tea and not actual tea bags means steeping tools and more to it than some new moms will want to deal with on the go or at work. Even though it’s made to increase lactation, there is no surefire guarantee that it will happen for every breastfeeding mom who tries it. Like most breast milk teas, Anna Naturals Nursing Mama Herbal Tea is formulated with natural ingredients and caffeine-free, made to help lactation progress more smoothly without any added stress. It comes in convenient pods that will fit into most instant coffee makers and therefore is brewed quickly. Since the tea uses the strong herb fenugreek blended with others and fruit too, the tea claims to taste better than most other lactation teas. Anna Naturals Nursing Mama Herbal Tea can be found on its website for $12 for 12 individual K-cups of tea. Of course, you can always check here for the latest prices and discounts. Anna Naturals Nursing Mama Herbal Tea comes in K-cup pods that will fit into most Keurig coffee makers. It’s caffeine-free and made with all natural ingredients. It’s made with a blend of fenugreek seed, rooibos, and fruit to make a better tasting tea for moms to enjoy. The tea claims to work for most mothers’ lactation increase within 24-72 hours of drinking it. At $12 per box, that averages out to $1 per cup of tea, which can add up if moms drink the recommended 1-3 cups per day. Though it’s designed to work with most Keurig brewers, that isn’t guaranteed for all models. Drinking three cups a day in order to see results might be overwhelming for some moms. Whether new moms decide to stick with breastfeeding or go the formula route, the baby will be able to get his other nutrients from her. But for those who want to breastfeed and find they’re having a hard time, that’s where breast milk teas come in. This Earth Mama Baby Milkmaid Tea review was designed to help parents decide if it’s what they do indeed need in order to produce more breast milk. Some moms might find the whole task daunting, or they might find themselves dealing with stress that makes it seem impossible for them to produce enough milk. Thankfully, that’s where something like Earth Mama Baby Milkmaid Tea comes in. For some moms, it works wonders, and for others, the taste is almost too bitter to handle, though the results might be more than worth it. Ultimately, it’s up to the mother to decide if the lactation tea is for her, but by all accounts, the Earth Mama Baby Milkmaid Tea seems to cover all the bases.